3 in 1 Handy Travel Set Kit - U-Shape Inflatable Neck Pillow for Sleeping & Rest + Comfortable Eye Mask + Soft Noise-Blocking Earplugs;Great for Long Journey on Plane;Train;Coach and More About This Product : Puffed Traveling Pillow;Black Eye Mask and Ear Plugs These are the tourist's true travel accessories that makes feel at ease and comfort. Designed to fit comfortably around the neck and shoulders;you can rest comfortably during long travel periods or just taking that short nap in office or home. The neck rest Air Bag can be inflated and wrapped for travel. The pillow is made up of soft surface material;perfect for car;plane or other travel uses. The black eye mask is fashionable;beautiful and comfortable. Soft;form-fitting ear plugs effectively reduce noise. Sit Back;Relax;and have comfortable Traveling. 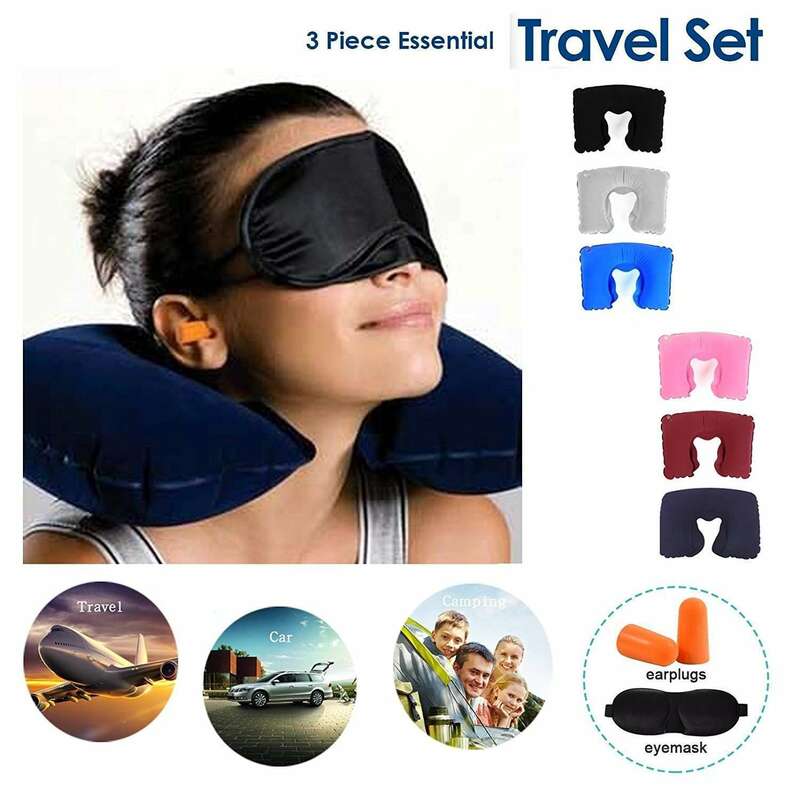 Product Features : Three Tourists Treasures - Includes 2 Anti-Noise Earplugs;Superfine Inflatable Travel Pillow and Eye Mask. Wearing It Can Effectively Reduce Sunlight;Increasing The Depth of Sleep and Improves Sleep Quality. Ideal for Creating a Comfortable and Quiet Environment While Taking a Short Rest in Office or at Home or While Traveling. Inflatable and Convenient to Carry Along. Portable to Carry the Pack Wherever;Whenever You Wish. The main function is to relieve tiredness on your neck;shoulder and waist. You can use them for travel;leisure at home;office noon break and more. From now on enjoy your travelling and sleeping well with our Travel Pillow Set Kit. Imagine a stress-free travel experience instantly with this travel set kit;Say Goodbye to Neck Pain on Your Travelling Order now and have a good trip!